Low-noise operation due to high-quality rifle bearing. The parallel arrangement of recesses on the outer side of the bearing shaft ensure uniform circulation of the high-quality oil and make the fan very quiet. 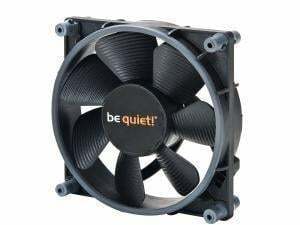 Mechanical noise is minimized by antivibration fasteners and the rubberized fan frame. The high-quality IC motor controller reduces electrical noise sources. Reliable cooling for up to 200,000 hours thanks to the high-quality rifle bearing. The flow-optimized surface structure of the fan blades produce more air flow in combination with smooth running. Screwless installation makes handling simple.